Hey everyone, Recent Data Migration is now available for all platforms supported by Cart2Cart! I guess, we should have started the article with something funny or corny, with an introduction, but these news are just too big for us to hold in, sorry. We’re too excited to tell you all the details. It happens a lot within our service that shop owners replatform and, then, new entities appear on their old shopping carts (for instance, they receive new orders). In such cases, an entirely new transfer is a waste of time, efforts and resources. And from now on, it isn’t necessary! You’ll be able to migrate products, customers and orders (or just the entities you select) easily. 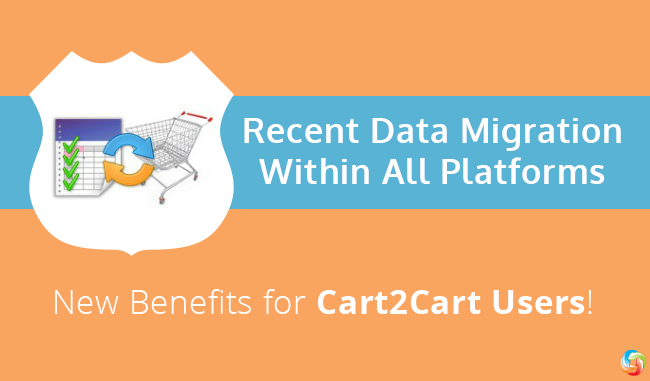 So, transfer data with Cart2Cart, set up your store on the favorite platform with peace of mind, and if any new data occurs on the old cart - transfer it safely, promptly and cheaply via Recent Data Migration Service. No matter which cart you’re on right now, and which you were using earlier.